Classy enough to chase home the unbeaten Pierro in the Group 1 Champagne Stakes last season, Dear Demi looks set for a successful campaign following a dominant display Saturday's Group 2 Furious Stakes (1400m) at Warwick Farm. With James McDonald in the saddle Dear Demi showed a blistering turn of foot to down the favourite Meidung (Bernardini) by three-quarters of a length with Jade Marauder (Fastnet Rock) a short-head away in third (photo Steve Hart). Trainer Clarry Connors said the daughter of Dehere would continue through the Princess Series in Sydney before heading to Melbourne for a crack at the Group 1 Victorian Oaks. "That's the plan. 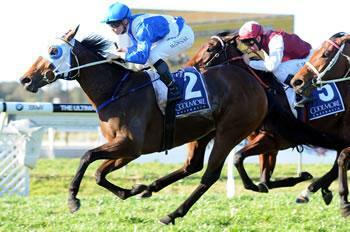 She'll go to the (Group 2) Tea Rose (1500m) in two weeks and then the (Group I) Flight Stakes (1600m)," he said. "We'll head to Melbourne after that and I've got no doubt she'll run 2500 metres." A $130,000 graduate of the 2011 Magic Millions Gold Coast Yearling Sale, Dear Demi races in the colours of her breeder John Singleton. She opened her stakes account in the Listed Fernhill Handicap last season before her fighting second to Pierro in the Champagne Stakes. She is the first foal out of the royally bred mare Shirley the product of Zabeel and the Golden Slipper winner Merlene. Delbridge Racing has a 2-y-old colt by Dehere, Great De Here, in work at Flemington with top trainer Mark Kavanagh.